Matt Bradley racing in the 2011 Hell of the North Road Race. June 2011 – The news hit Matt Bradley like a punch to the stomach. Cancer. Six little letters that carry an entire dictionary worth of impact. But his life changed in ways he never imagined after he felt some strange pain in his right foot in March of 2010. At first, Bradley said he thought maybe he had some problems with his shoe or maybe a pinched nerve. “I just ignored it for a while,” Bradley said. But in just a couple of months, the pain was too severe to ignore. 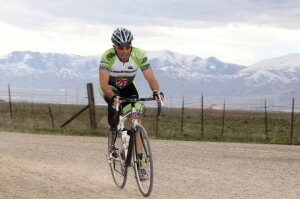 “Finally, in June, I did a race and the pain was so bad I couldn’t even clip in,” he said. A visit to the doctor where he thought he’d get a quick diagnosis and have a little recovery time was what he hoped for. Instead, his visit to the doctor became a life-altering experience – one that led to the amputation of his leg just below the knee. The pain that started in March became a fast-growing cancer diagnosis that required quick decisions. Normal, unfortunately, wasn’t an option. After discussing the options with his doctors, family and friends, Bradley decided the best – most effective – treatment was also the most drastic. His right foot – the one he used so often to push and pull with on his bike – would have to go. Chemotherapy and radiation were considered but the cancer was a type that was growing fast and could easily spread. So, in August – just a few short months after first feeling pain in his foot – Bradley and friends hopped on their bikes and enjoyed one last ride with ‘Righty” as they pedaled to the Huntsman Cancer Institute. Instead of amputation of just the foot, Bradley opted to have the lower portion of his leg removed as well because the prosthetic options were better and, despite the drastic move, he could more easily resume the passion that cycling gave him. Within a couple of weeks of the surgery, Bradley was on a bike, doing one-legged drills to prove cancer may have robbed him of his leg, but not his spirit and certainly not his drive. The Utah Cyclocross Series joined forces with Bradley – and other Utah cyclists affected by cancer such as Connor O’Leary and Cindy Yorgason — to host a ‘cross-out cancer’ event raising funds for the Lance Armstrong Foundation. That got his competitive fire burning a little bit and he picked up his training. Now, he’s back on the bike and lining up with the Cat 3 field again. He knows he’s at a bit of a disadvantage, but refuses to give up. Bradley, less than a year after the amputation, is back in the mix. There are times, Bradley admits, cancer could get him down. But he won’t let that happen.